Ancient India believed that all souls were a part of the Supreme soul. The soul of Human beings and the soul of an animal were never differentiated by any ancient religion of India. Animals were considered sacred always. In Indian tradition, animals are believed to have the same feelings as human beings. They are considered to have the ability to transform themselves at will and understand human speech, thus becoming divine. 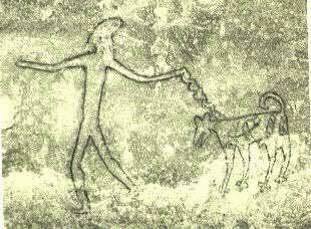 1) The earliest depiction of a domesticated dog is visible in the prehistoric paintings at Bhimbetka (Madhya Pradesh). Among several paintings of dogs, one in particular is worth mentioning, the one in a leash!! (10,000-7000 BCE). 2) Ramayana (7000-5000 BCE) has mention of dogs which were gifted by Kaikeyi’s father to his grandson Bharata. These gigantic dogs had sharp teeth and were as powerful as tigers. They were bred in the north west of the Indian subcontinent. 3) Mahabharata (4000-1900 BCE) starts and ends with a dog. 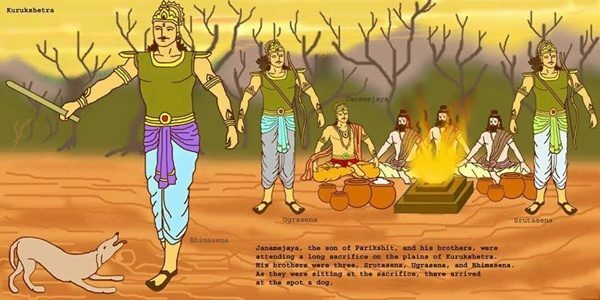 Mahabharata opens with the story of Janmejaya and his three brothers performing a sacrifice to destroy all snakes. A dog appears and is beaten up by the brothers. The mother of the dog returns with her pup and questions Janmajeya and curses that a great tragedy would strike him. Towards the end of the Mahabharata, the Pandavas decided to leave the world. While they crossed the Himalayas, the desert and Mount Meru, a dog accompanied them. Along the way, Draupadi and four Pandava brothers died leaving Yudhisthira and the dog. Indra appeared and offered to take Yudhisthira to heaven in his chariot, with a promise that he will meet Draupadi and his four brothers in heaven. Yudhisthira wanted the dog to accompany him in Indra’s chariot. Indra demurred, exhorting the King to give up the dog. Yudhisthira refused to leave behind the dog. Then Dharma, the God of death (Yama) emerged from the dog. This was the final test of righteousness for Yudhisthira who then left for Heaven. 4) Domesticated dogs have been found at many Harappan sites. In mature Harappan phase (2600-1700 BCE) dog remains have been found at almost all sites. A number of dog figurines have also been identified from several Harappan sites indicating the existence of several breeds. (2) a more highly bred dog allied to the modern mastiff. The only remains of dog from Harappa are of the grey hound type- with an elongated snout mastiff found from many site. 5) Indra’s (God of rain and thunderstorm) divine dog Sarama was mentioned in Rig Veda (1500-1000 BCE). Sarama’s children Sarameyas Shyama (the dark one) and Shabala (spotted) were mentioned in Atharva Veda. 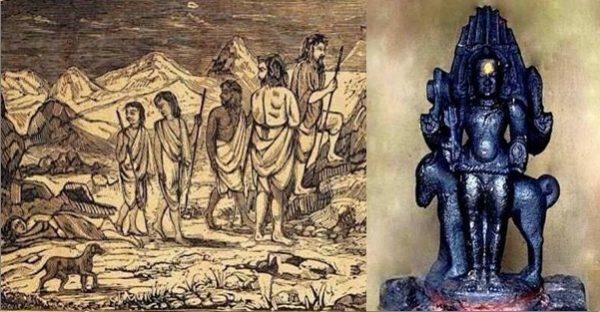 Rudra (Form of Shiva) was also mentioned in Atharva Veda surrounded by dogs with large mouths, made terrible noise and were respected. Dogs were also mentioned in Puranas. 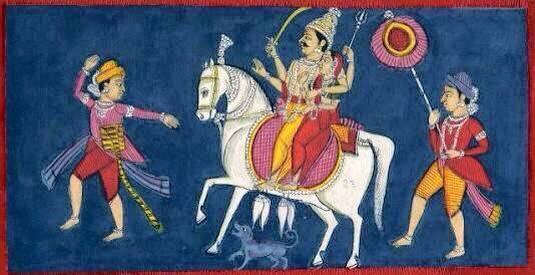 6) Bhairava: A form of Lord Shiva, the wandering sanyasi is usually accompanied by a dog. 7) Dattatreya: Incarnation of the holy Trinity: Brahma, Vishnu and Shiva is accompanied by four dogs. The dogs symbolise the four Vedas (Rig Veda, Yajur Veda, Sama Veda & Atharva Veda) and his complete mastery over them. 8)Khandoba : Another incarnation of Lord Shiva and patron deity of the Marathas. He rides a horse or bull and is accompanied by a dog. 9) Buddhism: Several Bodhisattvas were believed to have been born as dogs. Our beloved “dogs” were revered from ancient times. We must respect and love them. They are sacred and are one of the true manifestations of “Nature”. “The dates mentioned here are my views and can be debated”. Visit the author’s personal travel blog Travel Truth & Myth.